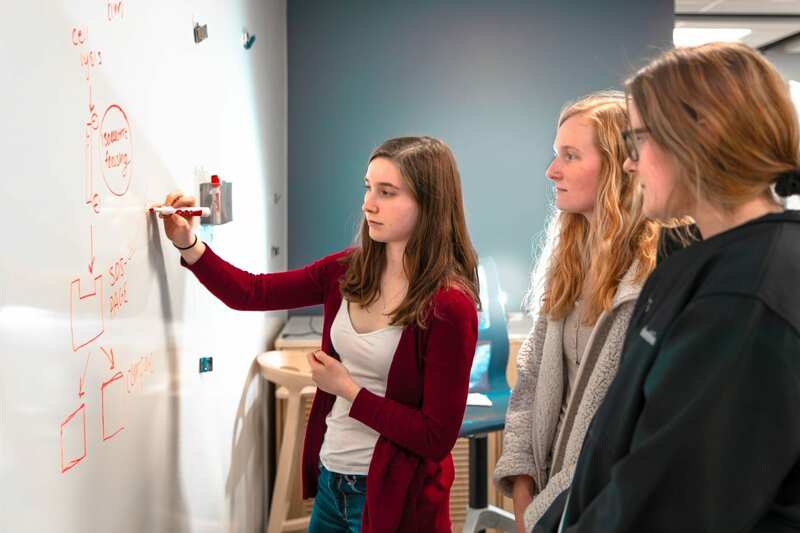 An essential component of active learning – defined by Bonwell and Eison in 1991’s Active Learning: Creating Excitement in the Classroom as anything that “involves students in doing things and thinking about the things they are doing” – is a learning space’s flexibility. The rigidity of old classroom designs shackled even the most creative teachers by dictating pedagogy. Driven by Penn State’s priorities of transforming education and driving digital innovation, the Bluebox aims to undo those shackles by providing a learning space limited in flexibility only by a faculty member’s creativity. What makes the Bluebox so flexible? To start, there is no “front” of the room. All four walls are “share walls” that can be written on with dry-erase markers. Every piece of furniture inside the space is mobile, a feature that offers a virtually unlimited array of configurations. With this ability, instructors can create myriad team-based, collaborative learning environments. The highlight of the Bluebox, however, is the eight-panel, fully-interactive Planar display. Students and instructors can connect to the panel wirelessly via iOS, Android, Mac, and PC devices. This makes any and all content produced during a course sharable. Also, because the display is comprised of eight panels it can be divided into smaller individual screens or used as one large screen. The Bluebox is a discipline-agnostic learning space. 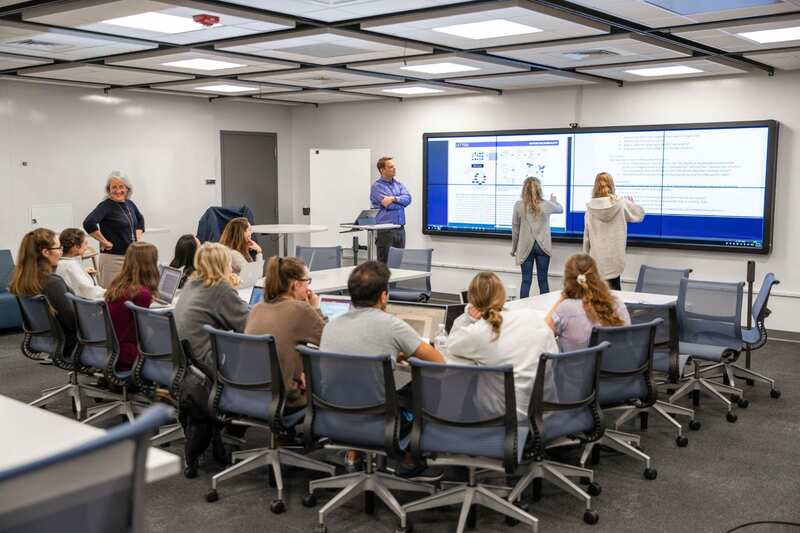 During its first semester in use, Fall 2016, the Bluebox hosted courses in biochemistry, molecular biology, astronomy, statistics, and information science technology. With each new course there is an opportunity not only to understand the space better but for faculty to learn new ways to teach in their discipline. TLT happily collaborates with and supports instructors who wish to engage in scholarship of teaching and learning research related to the Bluebox. 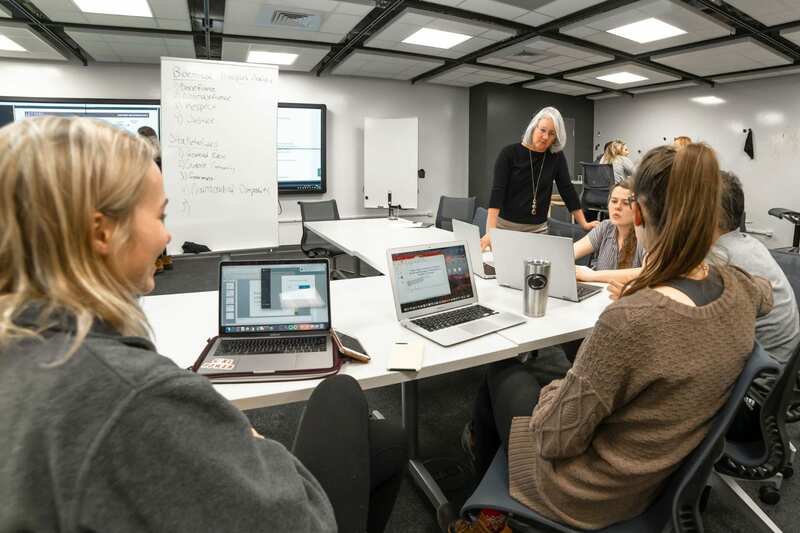 TLT’s learning spaces team and Penn State faculty who teach in the Bluebox engage in iterative cycles of teaching, reflection, adjustment, and more teaching. Together we discover new pedagogies, determine best practices, and contribute to the growing national discourse on effective learning spaces. 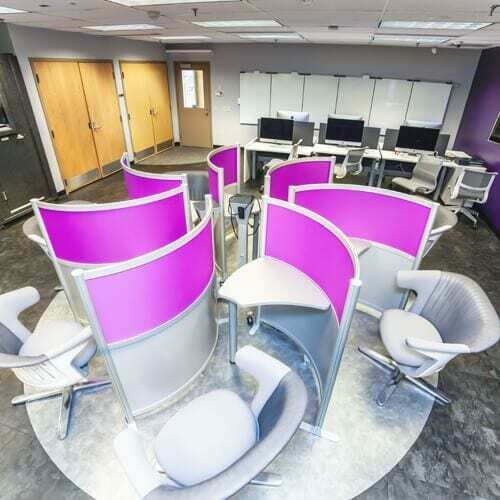 Bluebox’s features make it a dynamic and flexible space where active learning is possible. 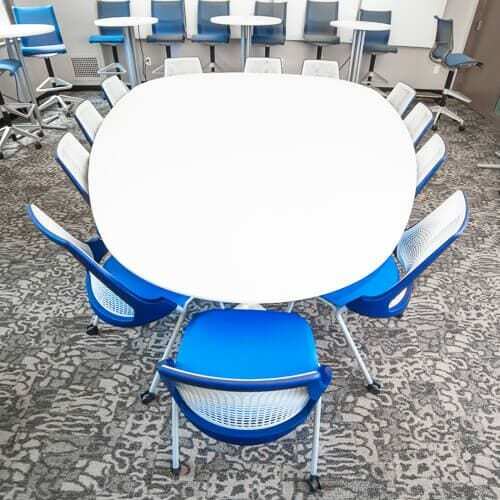 From small groups to whole class debates, movable furniture can support a wide range of instructional goals. An eight-panel interactive digital Planar display supports wireless screen sharing from almost any device. The display can be split by panel or can be used as one large screen. Whiteboard walls and movable whiteboards can be used by individual student groups or to partition the room into separate smaller learning spaces. I taught in Althouse, including the room that became the Bluebox, for over 40 years. Teaching in this space is so enjoyable it almost made me reconsider retirement. TLT is actively engaged in research efforts around our suite of learning spaces. Whether trying to understand the multi-dimensional nature of active learning in our Active Learning Classrooms or exploring what it means to learn in an “Experience Lab” like the DEX or IMAX labs or the Media or Maker Commons, we are developing new research methods to answer our unique questions. email and to which instructors can respond either by text or by video. Flashbacks solicit frequent, and brief, reflections about teaching in the Bluebox. Re-Captures invite faculty to re-create configurations of the classroom space in Google Drawings in response to reflective prompts. Faculty cohorts later reflect on their colleagues’ Re-Captured configurations and consider their implications for pedagogical practice. Download the most recent report on faculty and student experiences in the Bluebox. 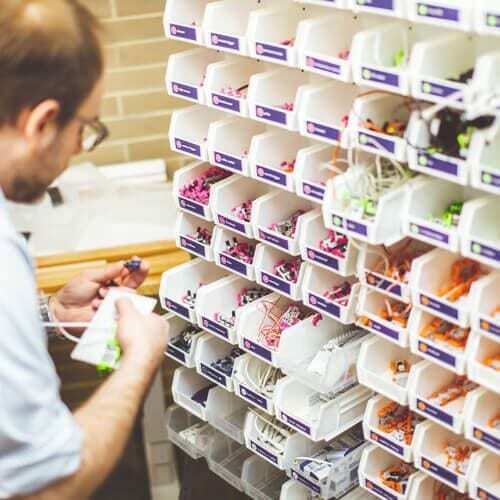 This university-wide initiative enriches the teaching and learning experience through 3D printing, rapid prototyping, design thinking and direct support for students, faculty and staff.